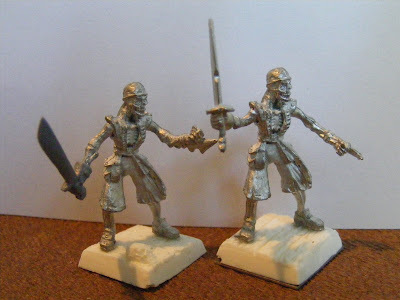 Top: Two Black Cat Minis skeleton captains. One is customized with a GW militia pistol. It's been awhile since I last posted... I've had alot going on. Prime among those obligations has been a job search. I feel like I've been to a thousand interviews, when in reality it's only been a few more than a dozen. With any luck, I'll hear back from one of the better options later this week and may be moving to a new position soon. My references have been checked and I've submitted work portfolios so here's hoping. Please wish me luck. Top: Two Reaper Razig characters. 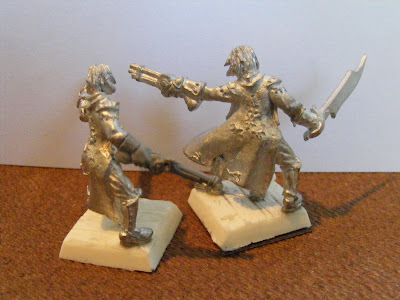 One is customized with a GW militia cutlass. On the gaming front, I've been keeping busy with the local MWS gaming club... 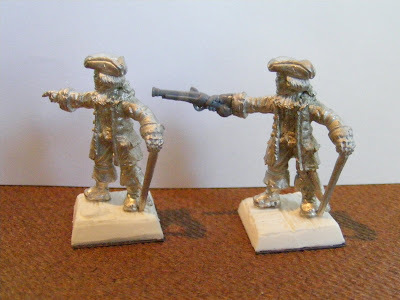 But the majority of my effort has gone into 28mm pirates. I volunteered to host a 28mm pirate game this month at MWS and DID! I wanted to give LOTHS a whirl, but I didn't have enough time to learn the system so we went with a very simplified fast version of Pirates! from Flagship Games. The game went really well and there were six players plus myself game-mastering. I ran it as a very simple beer & pretzels historical pirate bash. And true to form for Pirates!, the fellows on the smaller ships all ganged up to try and work Greg M, in the hulk. 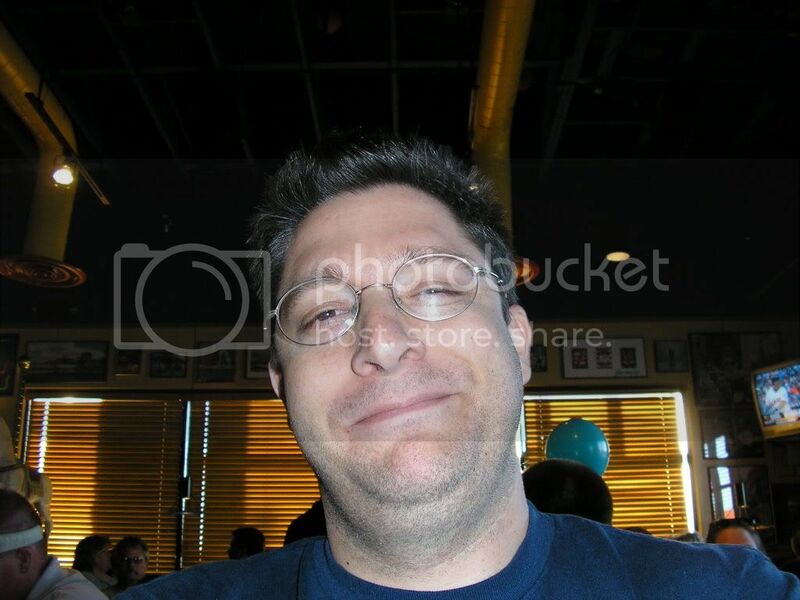 Greg was a great sport about it and I want to give my thanks to Don, Greg, Mike O., Harry, Joe and Mike W. I also owe a hearty thanks to Nils who lent me his Asian pirate ship. 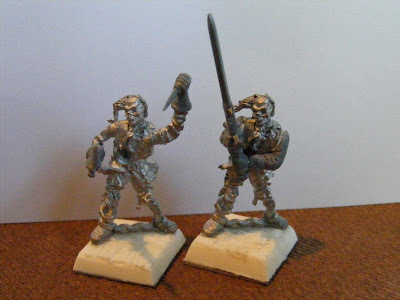 Top: Another shot of the Black Cat Minis skellie captains. Maksim ran his Pirates! game using a very simplified version to try out the game at theclub. Several of us had a rousing good time shooting up Greg M.'s ship! 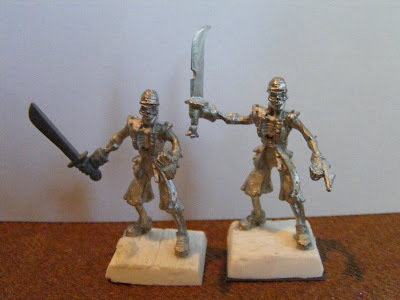 This weekend I've been working on my 28mm fantasy undead pirates since my game finally passed. During the weeks leading up to the Pirates! game I hosted, I exclusively worked on my historical pirate crews and let the fantasy ones sit neglected. 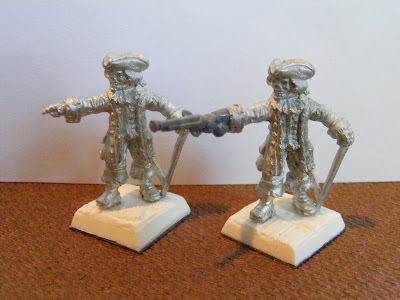 So, this weekend I pulled out the 28mm undead pirates and went to town. 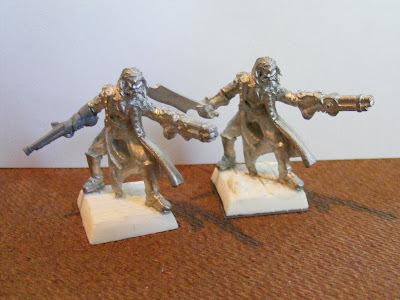 About a year or two ago, I first became interested in doing a 28mm undead fantasy army and at the time, one of our local gaming shops had a huge clear out sale on Reaper's 28mm Razig undead pirate faction so I bought out the lot. While I got a great deal, I also got alot of doubles and even triples of the rank & file and character minis. That's not such a problem for rank & file, but having three of the same character running about the board always looks odd so I planned to build one stock version of each character and customize any extras. 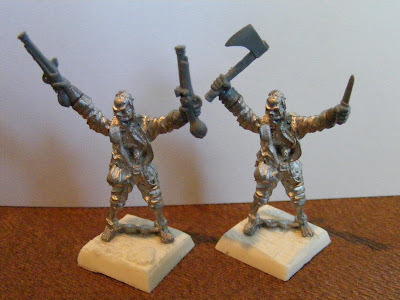 I primarily used some odd metal bitz from my collection and alot of GW plastic sprue bitz from the Vampire Counts skeleton, zombie and Empire militia sprues. 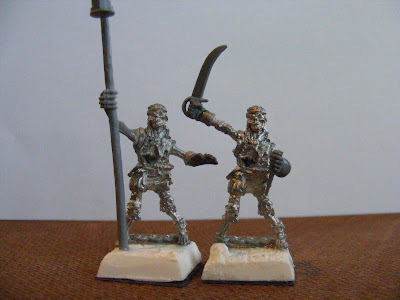 A last note is that all of the undead pirates are based on resin deck basing from Black Cat Miniatures. Top: Two more Reaper Razig characters. Top: A back view of two Reaper Razig characters. I also bought at least two packs of Razig's Chain Gang, which I didn't care much for, but I figured would mod up well. And they did. 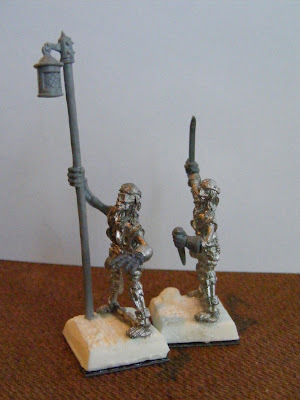 Top: Two originally identical mod'ed Razig Chain Gangers. Top: A view with a watch lantern in full view. Top: Another two Razig Chain Gangers. Top: The last two Razig Chain Gangers. Good gaming to you, reader! 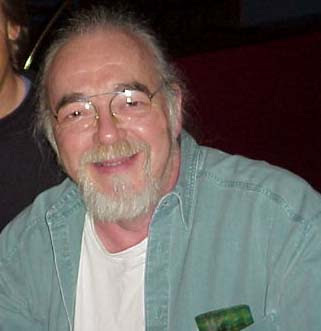 TOP: Gary Gygax Passes Away. RIP. (4 March 2008). Like alot of folks out there, I was a big Geek growing up in the 70s and 80s. Games and particularly fantasy RPGs (Role Playing Games) were huge. I studied Mythology and D&D side by side... I figured the 1rst Edition Monster Manual was at least as good as Edith Hamilton, D'Aulaires, or Bullfinch (...big mythology names). Rather than wax on, I'm going to leave you with a few words and two links, one from TMP, and the other from Jeff Rients, who has some excellent advice how to celebrate Gygax's life. So first my words and then the links. For good and bad, thank you, Gary Gygax! May you keep rolling 20's in a a better place!